MWC 2014: Huawei launches two tablets and Ascend G6 smartphone | What Hi-Fi? There have been plenty of smartphone and tablet manufacturers competing for attention at Mobile World Congress (MWC) 2014 as the latest portable products are unveiled for the first time. Joining those ranks is Chinese firm Huawei, which has been in Barcelona to launch three Android devices – including the "world's slimmest 7-inch LTE Cat4-enabled all-in-one phablet". On the tablet front, the new MediaPad X1 7.0 (pictured above) is described by Huawei as a phablet and is designed to bring smartphone and tablet functionality together in one 7in aluminum alloy device. It boasts a 1200 x 1920 FHD LTPS touch display and a 1.6GHz quad-core processor, in addition to a 5000 mAh battery with 21 days of standby time. It runs on Android 4.2 Jelly Bean. Features include a 13MP Sony Exmor R BSI rear-facing camera, while its 5MP front-facing camera includes Huawei's self-focus tips, preview screen and voice-activated hands-free capture. 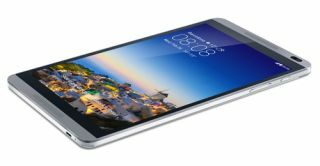 The second new tablet from Huawei is its MediaPad M1 8.0, which features an 8in, 800 x 1280 HD IPS multi-touch capacitive screen with SWS technology and dual-front facing speakers. Like the X1, the new aluminium M1 is powered by a 1.6GHz quad-core processor and incorporates a slim design at just 7.9mm thick. Under the cover, it has a 4800 mAh capacity battery. The M1's features also include a 1MP front-facing and a 5MP rear-facing camera. Both the M1 and the X1 have 2.4/5G dual-mode wi-fi support with voice call and SMS capabilities. It is thought the X1 will be available in western European markets from March 2014, while the M1 is set to arrive in Europe during Q1 2014 – an exact date is to be confirmed. "We're excited to unveil our new 4G LTE-enabled MediaPads, which deliver the essential pillars of happiness – health, connection to family, contact with friends and access to work," said Richard Yu, CEO, Huawei Consumer Business Group. In addition to the new tablets, Huawei has taken the wraps off its new Ascend G6 4G LTE-enabled smartphone; a device that boasts a 4.5in qHD 960 x 540 LCD display and 245 PPI. The Ascend G6 is 7.85mm thick and builds upon the Double C design of the Ascend P6, which we reviewed last year. There is also a 3G version of the G6, which is 7.5mm thick. Under the cover, you'll find a 1.2GHz quad-core processor and a 2000 mAh battery that gives up to 30 per cent power saving. The 4G model also supports NFC sharing for mobile payments. A 5MP front-facing camera and a 8MP AF BSI f/20 aperture rear-facing camera come with the new Ascend G6, which will be available in Q1 2014 (3G) and April 2014 (4G) respectively.